Diesel is an ultra-premium whey protein isolate, engineered to be the most advanced protein formulation ever designed. 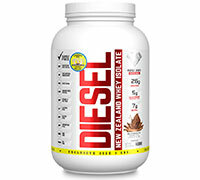 Derived from New Zealand whey protein isolate, Diesel uses whey from New Zealand cows that are “Meadow Fed (pesticide free)” and not given any antibiotics, rBGH or BST hormones. Containing the highest rated Biological Value (BV) protein (easily absorbed & utilized by the body), DIESEL also boasts all of the naturally occurring health benefits including; support of the immune system, liver function, wound healing and antioxidant production. But it doesn’t stop there! Diesel’s ultra-potent muscle enhancing formula is mega dosed with 7 grams of Branch Chain Amino Acids (BCAA’s) and 5 grams of L-Glutamine/Glutamic Acid, to help stop the breakdown effect of training and supply your muscles with what they need to rebuild, repair and grow. Diesel mixes instantly, contains natural ingredients and is suitable for Vegetarians! Diesel is peanut free, fat free, yeast free, wheat free, lactose free, gluten free and aspartame free. It’s the cleanest, purest and best tasting whey protein isolate available! Allergen Warning: Derived from milk. 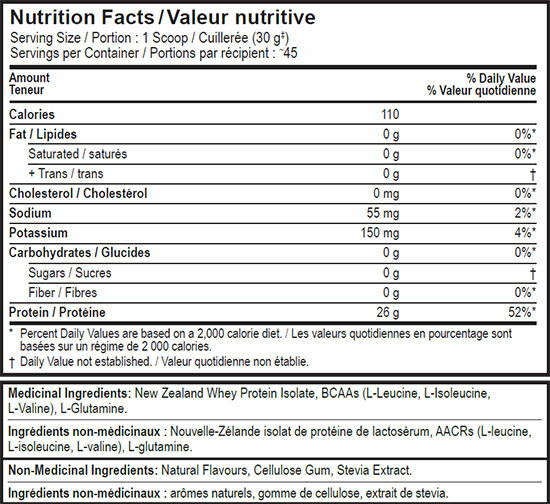 May contain trace amounts of lecithin (soy) to improve mix-ability. Recommended Use: Mix or shake 1 scoop (30g) of Diesel in 125 mL of your favourite beverage. Adjust amount of liquid to suit taste. Take 1 to 3 times daily or as recommended by a healthcare practitioner. Consult your healthcare practitioner prior to use if you are pregnant or breastfeeding or have liver or kidney disease. Ensure to drink enough fluid before, during, and after exercise.